While Ethiopia continues to pull through from the impact of the El Niño phenomenon-induced drought that left 10.2 million people in need of emergency assistance in 2015/16, the country is facing a new drought, due severe weather conditions – the cumulative effect of the negative Indian Ocean Dipole (IOD) and La Niña weather phenomena, causing the failure of the Hageya/Deyr rains (fall rain) in south eastern and eastern parts of the country. The drought has mainly resulted in severe water shortage and livestock deaths due to lack of pasture and high rate of animal disease. The drought has endangered lives and livelihoods of millions of the pastoralist households in southern and south-eastern lowland areas of the country. It occurred when people and livestock were still suffering from the effects of insufficient March 2016 rains.The Ethiopian Government with its humanitarian partners have issued the Humanitarian Requirement Document (HRD) in mid-January 2017 and declared that a total 5.6 million people are in need of urgent assistance. 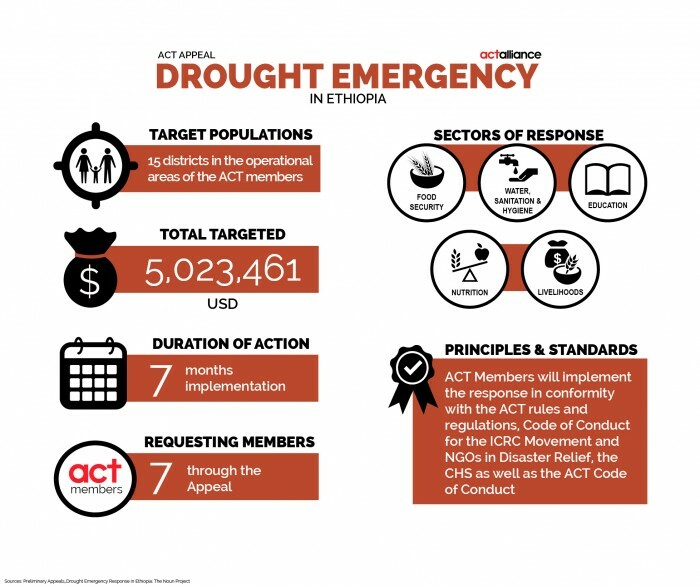 A total of USD 948 million has been requested.Members of the ACT Alliance Ethiopia Forum are currently responding to the 2015-16 El Niño-induced drought and are mobilizing additional resources and/or diverting scarce resources to meet urgent needs. CA, EECMY-DASSC, EOC-DICAC, HEKS/EPER, IOCC, LWF and NCA plan to carry out the following proposed preliminary activities: WASH (including provision of drinking water to persons and livestock, provision of water treatment chemicals, maintenance and rehabilitation of water supply infrastructure, as well as hygiene and sanitation promotion), Food Security, Nutrition, Education and Livelihood (including livestock health support and feeding).